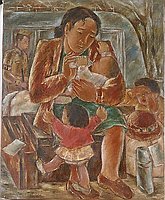 A woman seated on a chest cradles an infant in her left arm as she bottle feeds it, while she awaits evacuation. She is dressed in a green dress and brown jacket. The infant is in white. In the foreground, her little daughter, dressed in yellow with a red jacket, stands on her right shoe with arms upraised to be held. A thermos stands in the lower right corner. On either side of the chest is a tagged suitcase and white bundle with her hat atop. Behind them to the right, a woman in tan covers her face with her hands. In the background a soldier stands with his rifle in hand before a greyish structure. At the Fresno Assembly Center, Sugimoto had few art supplies, which accounts for his limited palette and predominant use of brown in paintings from this period. Despite his lack of materials, he experimented with composition, taking inspiration from the works dominated by imposing figures that he had seen in Mexico. 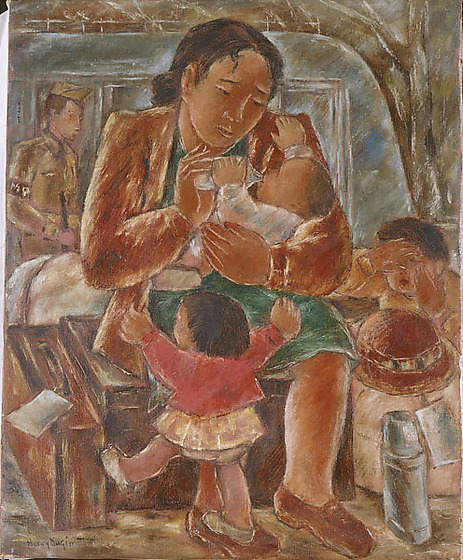 In this painting, for example, a mother and her children are the central focus, while in the background a soldier provides a reminder of the circumstances of evacuation.